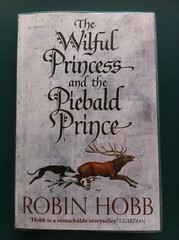 A novella recounting the origins of the Farseer witted line, and the swift change from the witted being regarded as contributing good to Six Duchies society to being outcasts to be pursued and exterminated. 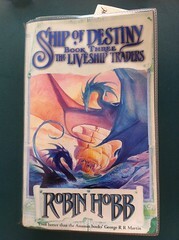 The last of the Liveship Traders trilogy. 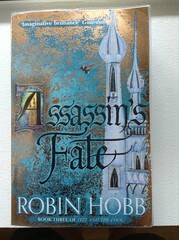 I found it slower going than most other Robin Hobb novels, and had to persevere through the politics. The return of the Lords of the Land, Sea and Air and other transformations were more satisfying – Malta’s from shallow, self-centred teen into smart negotiator and survivor, Selden’s from a shadowy presence into Tintaglia’s articulate courtier, Etta’s from whore to Queen, Wintrow from would-be priest of Sa into ship’s captain, Paragon from Mad Ship to whole ship (with a familiar face), and more – Alethia and Brashen, Ronica and Keffria, Kennit and Reyn, Traders and Rulers, they all change. 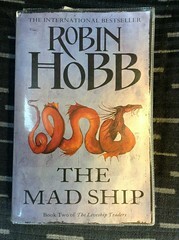 Ship of Destiny sets things up nicely for the Rain Wild Chronicles, which I’m now tempted to reread. The Jamaillia-Chalcedon-Bingtown conflict comes to a head. Three generations of the Vestrit Traders mature. Paragon is floated, Vivacia turns pirate, and we meet Tintaglia. 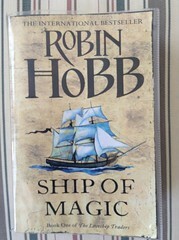 Very glad to have the third and final book in the Liveship Traders trilogy ready and waiting to be read!